Senegal's El Hadji Diouf has been fined £5,000 (about US $7,850) for spitting on a Celtic fan during a Uefa Cup match in Scotland last season. The player had denied the charge and was due to go on trial at Glasgow Sheriff Court on Thursday but changed his plea to guilty. The 22-year-old Liverpool striker was accused of assaulting Dominic Schiavone by spitting on him during the quarter final tie at Celtic Park, Glasgow, on 13 March. 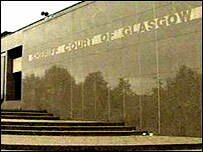 The court heard Diouf had been provoked by Mr Schiavone. 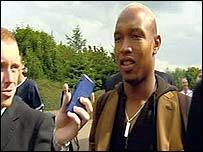 After the match, Uefa's disciplinary panel decided that El Hadji Diouf had been incited by supporters and fined Celtic $3,600. The $15.7m signing was fined two weeks' wages by the Anfield club. Diouf subsequently apologised to Mr Schiavone and invited him and a friend to Anfield as his guest for the second leg of the tie to preserve the "special relationship" between the two clubs. Passing sentence, the sheriff said he took into consideration the substantial fine imposed by his club, believed to be $47,000 and a two-match ban imposed by Uefa. However, he said the court must show its disapproval of his behaviour at a match being watched on TV. As he fined Diouf, Mr Schiavone shouted "yes" from the public benches. Joe Beltrami, defending, argued that his client had been gripped on the head by Mr Schiavone, an act which in Senegal was disrespectful and reminiscent of masters counting their slaves. He also said spitting was not a criminal offence in Senegal.